Last week, Adobe released a slew of cool updates to the Cohort Tables in Analysis Workspace. For those of you who suffered through my retention posts of 2017, you will know that this is something I have been looking forward to! In this post, I will share an example of how you can use one of the new updates, a feature called rolling calculation. 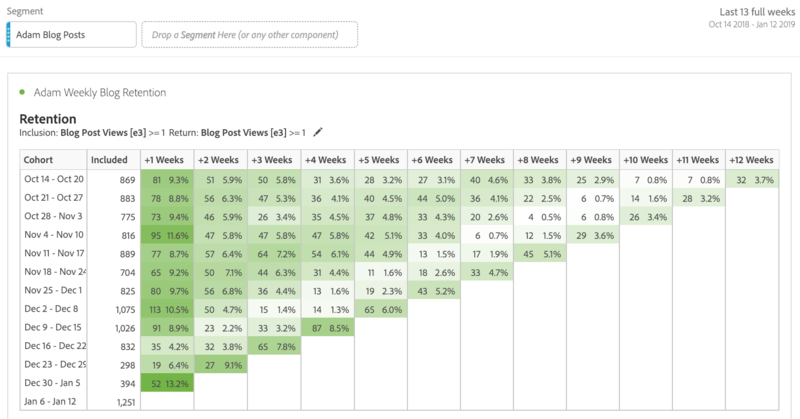 A pretty standard use case for cohort tables is looking to see how often a website visitor came to your site, performed an action and then returned to perform another action. The two actions can be the same or different. The most popular example is probably people who ordered something on your site and then came back and ordered again. You are essentially looking for “cohorts” that were the same people doing both actions. These reports are good at letting me know how many visitors who read a blog post in January of 2018 came back to read a post in February, March, etc… In this case, it looks like my blog posts in July, August & September did better than other months at driving retention. However, one thing that these reports don’t tell me is whether the same visitors returned every week (or month). Knowing this tells you how loyal your visitors are over time (bearing in mind that cookie deletion will make people look less loyal!). This ability to see the same visitors rolling through all of your cohort reports is what Adobe has added. Even though the rolling calculation cohort feature can be a bit humbling, it is a really cool feature that can be used in many different ways. For example, if you are an online retailer, you might want to use the QUARTER granularity option and see what % of visitors who purchase from you at least once every quarter. If you manage a financial services site, you might want to see how often the same visitors return each month to check their online bank statements or make payments.